All the icons (religious paintings) in the chapel have been executed in the traditional Byzantine style which expresses visually the theology of the Greek Orthodox Church. Most of the icons in this chapel have been painted directly on its walls and domes. Paintings done in this manner are called frescoes. The inscriptions on the icons are in Greek. The verse over the entranceway says "Come, whoever is thirsty; accept the water of life as a gift, whoever wants it." (Revelations 22:17) Holding the scroll on which it is written are peacocks, used in Christian art as a symbol of The Resurrection. Entering the chapel, you see candles to the right and left. When an Orthodox Christian enters his or her local church, an offering is made and a candle is lit, bringing to remembrance the words of Jesus Christ, "I am the Light of the World." 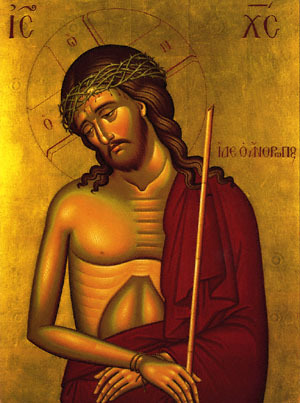 Then the believer will kiss the icon which is available for that purpose. In this case, the icon of St. Photios is to the right and the icon of Mary and the Christ child is to the left. For the Orthodox, this kiss is not an act of worship but veneration of persons who lived holy lives. The fresco to your right depicts St. Photios teaching two young missionaries. Constantine and Michael, whom he sent into Moravia to preach the gospel of Christ. The work of these two men, who are known to us as Sts. Cyril and Methodios, resulted in the conversion of the Slavic peoples to Christianity. To the left, St. Photios is seen in the court of the Byzantine Emperor Michael III. At this moment, Photios has been called to become Patriarch of Constantinople, the capital of the Empire. A court aide stands by with the Patriarch's mitre (crown). In the dome is depicted the Hospitality of Abraham. Three angels sit at the table where they have just been served by Abraham and Sarah (Genesis 18:1). These angels are interpreted as representing the Holy Trinity. As you pass through the archway you notice two early defenders of the Christian Faith, St. George on the left column and St. Demetrios on the right. In the Medallion above is St. Katherine. In the central dome is Christ the Pantocrator (the all-embracing). Around the circle are written words from Revelations 1:8, "I am the Alpha and the Omega, the beginning and the end, says the LORD who embraces all, who is, who was, and who is to come." In the four pendentives are the Evangelists, the pillars of the Church, Matthew, Mark, Luke and John. On the arch leading to the altar area are two deacons. To the left is St. Stephen, the first martyr of the Christian Church, to the right is St. Romanos the Melodist, one of the best known hymnographers of the Orthodox Church. In the center of the arch is a dove, used in iconography to symbolize the Holy Spirit. The Holy Altar Table is made of Italian Botticini marble with decorative mosaic work (as are all marble chapel appointments). At the consecration of the National Shrine on February 10, 1985, relics (tiny bone particles) of three women saints were sealed within a cavity in the top of the Altar Table: Saint Euphemia, who was martyred on September 16, 305; Saint Solomonee, a fourth century saint; and Saint Theodora, a ninth century Empress of Byzantium, who presided at the General Council in 843 A.D., which restored icons to use in Orthodox worship. St. Theordora, whose Feastday is February 11, was a contemporary of St. Photios. The fresco in the dome over the altar is entitled Christ in Glory. In the icon to the right are The Three Hierarchs: St. Gergory the Theologian, St. John the Chrysostom (golden-mouthed), and St. Basil the Great. In the fresco to the left are St. Spyridon the Wonderworker, St. Iakovos (James), called the brother of the Lord, and St. Nektarios of Aegina, a 20th century saint. The fresco behind the altar is called Mother of God – More Spacious than the Heavens. In Orthodox Christian piety and theology, Mary is referred to as the Mother of God, having given birth to the incarnated second person of the Holy Trinity, Jesus Christ. In the area to the right of the altar, you pass through the arch with St. Andrew, the First-Called Apostle, and St. Anthony, the founder of Orthodox Monasticism. In the medallion you see St. Irene Chrysovalantou, a saint of the ninth century. Located here is the marble and mosaic Bishop's Throne, used only by the Bishop during worship services. Jesus is depicted on the Throne as the High Priest. (Hebrews 5:5). The dome in this area depicts the Archangel Michael. To the left are Jesus Christ and St. John the forerunner, whose scroll reads: "Behold, the lamb of God, who lifts the sins of the world. "(John 1:29). To the right is the Nativity. The Virgin Mary and Jesus are in the center in the cave where the animals were kept. Joseph, in the lower left-hand corner, while contemplating the miracle of Jesus' birth, is tempted by the devil (personified by an old man). In the lower right hand corner, midwives wash the newborn babe, while up above, the angels proclaim the good news to the shepherds. Straight ahead is the glorious fresco of the Resurrection. Christ is seen trampling the gates of hell and freeing Adam and Eve and other holy persons from the Old Testament times from the bonds which held them unjustly enslaved. Not visible is the sachristy and the vesting area, located to the right of the altar. In this area, the priest vests himself and prepares the elements (bread and wine) on the Table of Oblation for Holy Communion. In the arched area over this table is a fresco of the Nativity (smaller, but identical to the same fresco in the chapel).